Practical household pliers set comprising of combination pliers, long nose pliers, diagonal side cutters and a pair of water pump pliers. With such a choice the plier set enables a wide range of jobs to be professionally achieved in the home or in the work environment, including cutting and stripping wires, fiddly electronics and plumbing tasks amongst others. 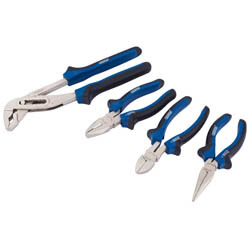 All the pliers are forged from carbon steel, which is correctly hardened and tempered for added strength and durability. Fitted with soft grip handles providing comfort even when used for prolonged periods. Ideal set for domestic and professional use.